“Please! 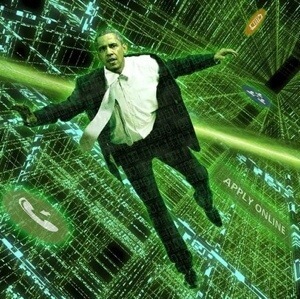 Just get me out of here!” Obama added as the data grid below his feet shattered into millions of infinitesimal pixels and he plummeted into an infinite void of lost health care coverage. —Terrified Obama Trapped Inside Healthcare.gov Website | The Onion – Americas Finest News Source. 24 Nov 2013 in Amusing, Cyberculture, Government, Health, PopCult, Rhetoric.